We all know australien Graffiti Writer Sofles from his cool timelapse Videos where he really sat new standards in the Graffiti scene and got his name up worldwide. He is doing that while combining two very creative artforms – Graffiti and Video. In both amazing director Selina Miles mastered the triggers that makes you want to watch the painted piece itself as well as the way the story is told and the video is beeing shot – is it a timelapse or as in his latest piece the usage of a drone. But why is she so successful? The answer his simple. Selina always takes another step. As in her former videos it’s not just enough for her to do a simple timelapse behind someone painting a Graffiti-Piece. She conceptualizes the whole video and makes it more interesting through the change of what you see on the wall and of course through the moved Hyperlapse that makes you want to follow Sofles through the whole room. In her latest wayfarer video you can find the same triggers. It makes you watch a ten Minute video while everyone would tell you we live in a One-Minute-Max time. In first place it’s all about the drone. Like in the timelapse videos she’s not satisfied with using a simple drone shot. She takes the drone for a walk and uses another filming technique to make it more interesting – the one shot! We don’t see the drone just on one spot but following the writer through the whole city. You just want see whats behind the next corner and stay focused on the video. Another trigger is of course the Graffiti-Writing itself. 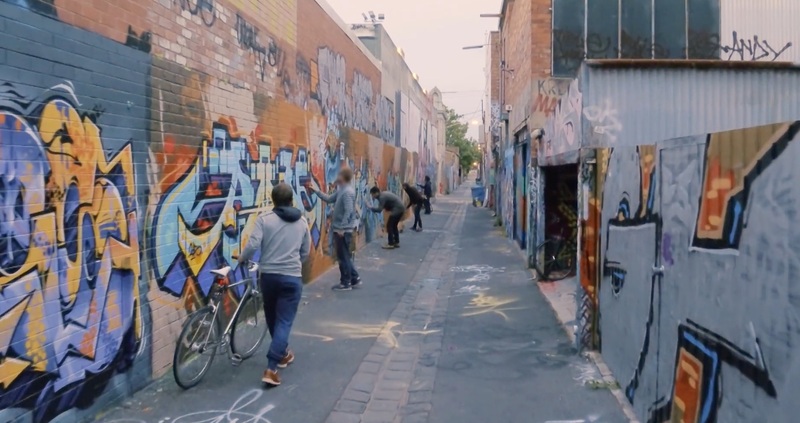 It’s not just one piece Sofles setting up but a combination of his own pieces and tags as well as an overview of the Melbourne based Graffiti scene. The third and for me really important trigger is the light. She chose to film the whole scenery in the blue hour when it’s still bright enough but gets a moody feeling through the street and car lights. It creates a creamy and warm but also mysterious atmosphere – a perfect background for any video. Make sure to check out Selina Miles’ work over here and thanks to Johannes of Modest Department for the link.